Taken from https://technet.microsoft.com/en-us/library/hh825089.aspx and modified to my PC. > Scratch directory set to 'C:\Users\SHAYAA~1.SID\AppData\Local\Temp\'. > Getting the collection of providers from a local provider store type. > Succesfully registered commands for the provider: WimManager. > DISM   DISM Provider Store: PID=9312 TID=12912 Found the OSServices. I am trying to create an external bootable WIndows 10 PC that can be updated with software updates. Using Windows To Go was great until we found out that it can't receive updates. and click on Start. This creates a proper Windows To Go drive wich can be updated fine. Not the answer you're looking for? Browse other questions tagged windows windows-10 dism windows-to-go or ask your own question. 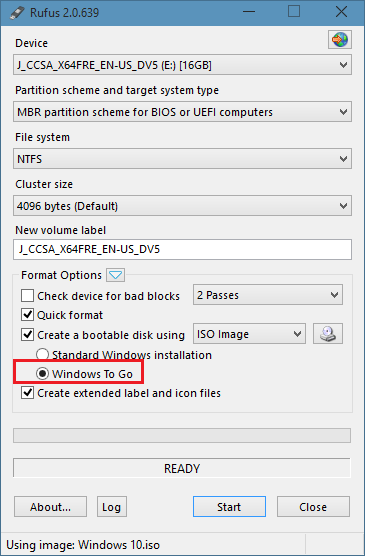 Can I transfer an external hdd with Windows to go to internal sata hdd?